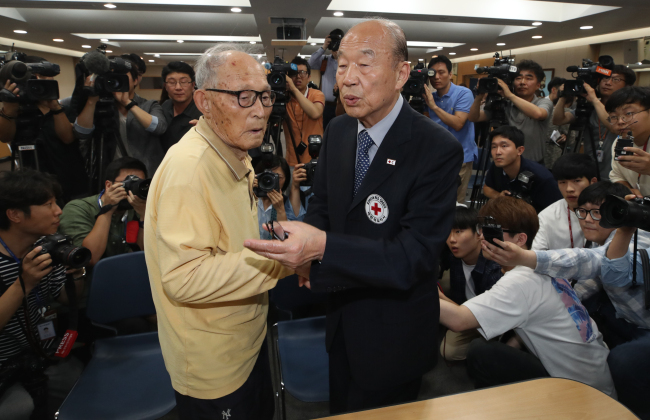 South Korea will tap into a state fund to help cover the costs to reunite families separated by the 1950-53 Korean War, scheduled for next month, the Ministry of Unification said Wednesday. Following a series of panel meetings held from July 11-16, the Seoul government decided to offer about 3.2 billion won ($2.83 million) to cover costs for the Aug. 20-26 reunions, according to the ministry. Event preparations will receive support of about 2 billion won, while 1 billion won will go to repairing facilities at the North’s Kumgangsan resort, the venue for the reunions. The money will come from the inter-Korean cooperation fund, which South Korea set up in 1991 to facilitate cross-border exchanges. The fund had stood at nearly 1 trillion won in 2008, but it dipped below that level in 2017 and 2018 -- especially after the South used the fund to support North Koreans that participated in the PyeongChang Winter Olympics earlier this year. The government has also approved 86 million won to be used for the opening of a liaison office in the North’s border town of Kaesong, added the ministry. It will determine whether additional investments will be needed upon completion of ongoing repair work of the facilities. As part of efforts to implement the agreements reached between their leaders at the April summit, the two Koreas have been cooperating toward the revival of the reunion event, last held in 2015, as well as the establishment of the joint liaison office. South Korea in recent months has dispatched teams to Kumgangsan and Kaesong, respectively, to inspect and repair relevant facilities that were believed to be abandoned for years. Ministry spokesman Baik Tae-hyun noted during a regular press briefing that the amount compared to 2.35 billion won the Seoul government spent for the previous family reunion event in October 2015. He also summarized that about two-thirds of the money would be used for the event itself, while the remainder would be spent mostly on repairing the facilities.